As a first step in evaluating the connections between prehistoric and modern Pueblo societies, it’s necessary to define exactly which societies we’re talking about here. This post is a brief overview of the prehistoric cultures and modern ethnolinguistic groups in question. As noted below, these are not necessarily equivalent units, and failing to recognize this has been a frequent problem with previous reconstructions of Southwestern culture history. 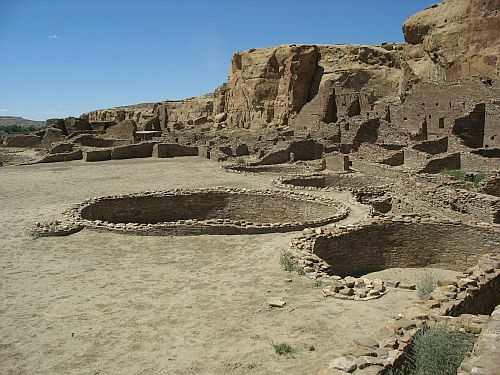 Chaco Branch: The primary center of this branch is of course Chaco Canyon in northwestern New Mexico, but it extended over the entirety of the southern San Juan Basin and further south into the drainage of the Rio Puerco of the West. There are various distinctive characteristics of this branch prior to about AD 1200, when it seems to converge with the Mesa Verde branch before disappearing entirely. Mesa Verde Branch: While Mesa Verde proper is historically the area of main research focus for this branch, recent research has shown that it was much more widespread, extending thoughout much of southwestern Colorado and southeastern Utah. The exact nature of its relationship with the Chaco branch is still unclear, but there has been increasing evidence for cultural similarity and historical connections between the two. There is a clear pattern of alternating population concentration implying migration between north and south on a scale of centuries prior to the depopulation of the entire area before AD 1300. 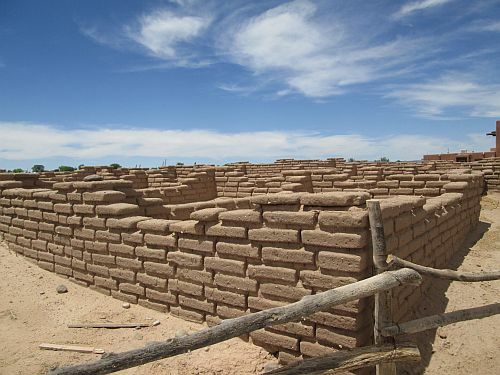 Kayenta Branch: Located in northeastern Arizona, this branch shows some clear cultural differences from Chaco and Mesa Verde, but certain sites do show evidence of influence from Mesa Verde especially during the Tsegi Phase from AD 1250 to 1300. The cliff dwellings of Navajo National Monument and Canyon de Chelly are probably the best known Kayenta sites. On the modern side, there are 19 Pueblos in New Mexico, plus several on the Hopi Reservation in Arizona and a few communities of Pueblo ancestry in the vicinity of El Paso, Texas. They belong to six known linguistic groups, listed below. Hopi: This language belongs to the Uto-Aztecan family, one of the more widespread and well-documented families of North and Central America. As the name implies, the family includes both the Great Basin hunter-gatherers of the Numic subfamily (Ute, Paiute, and Shoshone) and the complex agricultural Aztecs of the Basin of Mexico, as well as many groups in between. As a result, this family is among the best examples in the world of a lack of correlation between language family and economic orientation. The Hopis fall in between the extremes of the Numa and the Aztecs, and their language forms its own branch of Uto-Aztecan sufficiently different from the others to make it very difficult to draw any culture-historical conclusions. The three Hopi mesas (unimaginatively named “First,” “Second,” and “Third” in English) have distinctive dialects that further complicate the situation. Zuni: Today this is just a single pueblo, speaking a language generally considered an isolate unrelated to any other. Prior to the Pueblo Revolt of 1680 there were several Zuni pueblos, however. In addition to language, there are several other aspects of Zuni culture that tend to distinguish it from the other pueblos, although there are also enough similarities to Hopi to distinguish the two as “western” pueblos in contrast to those further east. Keres: This is another language isolate, but spoken by several historically autonomous pueblos that still retain separate identities and speak slightly different dialects of a single mutually intelligible language. The Keres pueblos form a “bridge” in some respects between the western and eastern pueblos. Acoma and Laguna tend to pattern more with Hopi and Zuni, while Zia, Santa Ana, San Felipe, Cochiti, and Santo Domingo are located further east and tend to have more similarities to the Rio Grande Pueblos. Tiwa: This subfamily is in turn divided into Northern and Southern divisions, which occupy the extreme north and south portions of the modern Pueblo domain. Northern Tiwa is spoken in Taos and Picuris, while Southern Tiwa is spoken at Sandia and Isleta in the vicinity of modern Albuquerque. 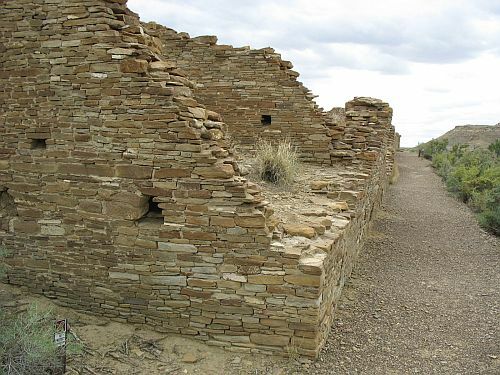 Tiwa was also spoken historically at Ysleta del Sur near El Paso, Texas, which was founded by Southern Tiwas displaced during the Pueblo Revolt of 1680. There is some evidence that the Piro pueblos south of the Southern Tiwa also spoke a language closely related to Tiwa, although this language is poorly documented and is now extinct. Tewa: This subfamily occupies the portions of the northern Rio Grande valley near modern Santa Fe, in the pueblos of San Juan, Santa Clara, San Ildefonso, Nambe, Tesuque, Pojoaque. 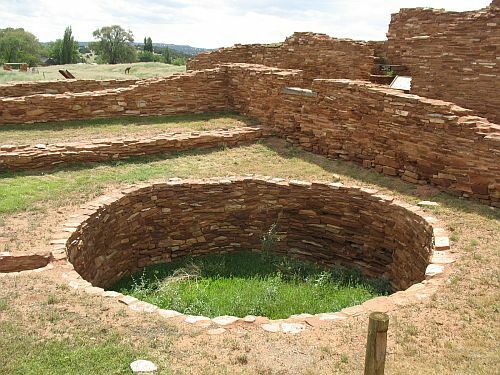 A closely related dialect was also spoken further south in the Galisteo Basin until approximately 1700, when the remaining residents of that area moved to the Hopi area of Arizona and founded the pueblo on First Mesa known as Hano (or Tewa), which continues to speak a dialect of the Tewa language to this day. Towa: Today this language is spoken only at Jemez Pueblo on the western edge of the Rio Grande region, but until the 1830s it was also spoken at Pecos on the eastern edge. When the pueblo of Pecos was abandoned its remaining inhabitants moved to Jemez, where their descendants still form a distinctive segment of the population. So that’s the present situation. The picture is complicated, and it’s hard to figure out what the historical events that resulted in this arrangement would have been. The fact that Tiwa occupies both the northern and southern ends of the Rio Grande culture area, while Towa occupies the eastern and western peripheries and Keres occupies both a core part of the center of the region and an area further west that is more similar culturally to Hopi and Zuni, makes it difficult to fit the known facts into a simple scheme of migration or cultural diffusion. Clearly the story must be more complicated, and digging into those complexities will be the purpose of the following posts in this series.